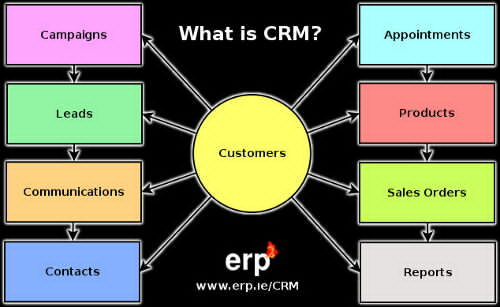 CRM means “Customer Relationship Management”. A CRM System is a software system which is used for managing a Customer Database in an Enterprise. Fig. 1 - What is CRM? People sometimes also refer to CRM Systems as CRM Software, a CRM Solution or CRM Platforms. These all refer to business software applications used to manage a business and its resources. What are the features of a CRM System? CRM systems can contain many more features, especially in industry-specific CRM software. What is the purpose of CRM Software? The purpose of CRM is to increase sales and enhance customer retention. Every business investment should be profitable and this is no different with software. Within a relatively short period of time (for example, one year), a new CRM system should have paid for itself in increased profits either by saving the organisation expense or by creating additional revenue. Every CRM implementation should be planned with specific milestones which are measurable. This tells the stakeholders how effective the introduction of the system has been. For example, the goal of the new system may be to reduce customer waiting time and thus total call time by 50%. The call logs should be measured before and after the implementation and the system planned to achieve this goal. Then a report can be generated to show whether or not these goals have been met. The precise purpose depends on the analysis of the business organisation. This is another reason why a custom CRM system (of the right type) can be highly beneficial – in order to solve company-specific problems. Who is a CRM System for? Almost every business can benefit from implementing a CRM system, however some more so than others. A single hot-dog stall owner may be able to remember his or her regular customer names and requirements as they interact personally with each client. However, a call centre with thousands of employees would find it impossible to update each other on the hundreds of calls they handle each day manually. A CRM system is a definite requirement for such an environment. Most importantly, even with a handful of clients an simple products with a low employee count, any business that takes part in marketing in more than one location should use a CRM system. This tells the business, along with a media code, where the client was acquired. This is worth its weight in gold – marketing efforts are only effective in the long term if they are measured. You will know which advertisements were profitable and which weren't. What are the reasons for using a ERP? There may be many more and it is important that the organisation is clear on its purpose before it begins the search for a suitable system. Even simply tracking the level of customer satisfaction in the CRM empowers the business to make informed decisions on how to modify the CRM and processes to better enhance customer satisfaction itself! Is it possible that you can run a business without a ERP? Yes, of course it is entirely possible to run some business types without a CRM. People have been running businesses for thousands of years without a CRM system. However, as more and more businesses adopt CRM software, the business landscape becomes more competitive. As a business grows, the organisation of information becomes more and more important. Of course, humans can be forgetful and papers are limited in their scope (being 2 dimensional). Also, it is difficult to share paper based files across remote sites and only one copy can be seen at once (unless you have multiple copies which then ends up in discrepancies between the versions. The same problem exists with spreadsheet information where a company uses one spreadsheet for a list of customers and order details. Being 2 dimensional, it ends up with multiple rows for one customer or with other linked sheets and many sheets for orders. Then a link need to be made for product son orders. This all becomes very confusing and, even if this is overcome, the problem still exists of the single shared file. Most businesses without a CRM implement some type of spreadsheet solution. Luckily, this data can usually be imported to the new CRM system. How does a CRM System help you to find Customers? Used properly, a CRM system is the go-to tool for acquiring and retaining customers most effectively. How can a CRM System help you to improve your relationship with your Customer? For example, setting a birthday reminder will show the customer that you are a caring organisation who remembered their special day. If they share their social media links with you and you become their follower, friend or Linked In connection, you will be able to keep up to date with their posts. A photo on the customer contact profile is useful in many cases, especially if your staff have face-to-face or video chat meetings with client contacts. Also, as your staff build relationships with clients, a CRM can tag employees as primary contacts for certain clients, routing their calls to those account managers as a priority. This makes the client feel important and more satisfied with the service they receive. It provides an increased opportunity for the clients preferred contact to deepen their relationship with the client. What applications are typically in CRM systems? With the User and Group applications, an administrator can manage user access tot he other various applications. What fields are typically in CRM Applications? Each record has an ID for that type – e.g. every customer has a unique customer ID and every product has a unique product ID. This is how, for example, Communications are connected to Customers and Products are connected to Sales Orders. What are the different types of CRM system? The most popular CRM systems today are remotely-installed multi-user systems. This usually allows the users to access their CRM data off-site, although professional CRM solutions allow for access restriction based on the IP address for security purposes. A single user system may be used by a sole trader, consultant or other professional that needs the benefits of a customer database. However, in most circumstances an assistant needs access to the system as the database grows so multi-user systems are the most popular. Locally installed CRM systems don't usually give access outside the local network unless specifically configured to do so. The reason for requiring remote access is usually for people like Sales Representatives to access client records on the road or for company executives to monitor on-site activity. To do this, the router of the organisation is required to be configured to give a server external access. This can be a security risk if the server is not properly configured and maintained. When choosing a CRM system, It is important to make sure it is capable of doing what you want it to do. When can a CRM system be used? CRM systems that are locally installed are generally only accessible in the workplace unless special provision is made for external access. Web-based systems such as Cloud applications are generally accessible 24/7 and provided with 99. (% uptime availability guarantees. How are CRM systems installed? This depends on the type of the system you are implementing. Some large on-site vendors send several consultants to install enterprise CRM systems locally and the process can take several months. Special server hardware may be required. Cloud based solutions are usually up and running in a mater of days but may not have the level of customisation as other systems. In this case, no action is required by a consultant on site and the users can log in and begin to use the system. Some training may be provided by video lessons. This type of system may only be useful to smaller organisations. Operating system level CRM systems that use proprietary protocols (i.e. not web-server based) present a particular problem as they are reliant on the underlying operating system and remove the freedom from the organisation to use the software as they wish. Usually., with these type of CRM systems, a local client application is required to be installed. This again creates a strong reliance on the vendor and is thus problematic. In the Internet Age we hope to be able to access our data from any device at any time, that means using open standards and internet connectivity. Remote systems provide access from anywhere. However, because most companies do not own web-servers, CRM vendors often promote 'cloud based' CRM systems. These are most often 'SaaS' or Software as a Service. While 'cloud' and 'SaaS' sound like friendly terms, what these actually mean is that the user has no legal control over the software. They have no ability to download and use the software offline or migrate the system to another server. However, locally installed systems can also suffer form the lack of control – so what is the best solution for an organisation wishing to benefit from the power of a CRM without the pitfalls? Simply, remotely installed Free Software CRM. Most CRM Vendors today are Proprietary software vendors. That means that they have restrictive software licenses. Proprietary software comers with several risks attached. One risk is the inability to use the software as you wish. You are generally unable to use the software on as many systems as you like, and have limited users. The model that proprietary software usually uses when deployed as a remote service is pay-per-user, so this makes it impossible. Installed client software often uses 'License Keys'. These are restrictive and prevent the organisation from growing organically. Pay-per user is understandable if this is regarding a provision of resources for server access but in most cases it is not – it is the right for a user of one name to use the license, it is contract based, not resource based. 'Free Software' does not mean non-paid – it means Free as in Freedom. This provides the company with the freedom they need to modify, copy, share and use the software as they wish. It is possible to acquire no-cost CRM solution, however this presents additional risks. If there is no financial payment then there is no obligation on the vendor to continue to supply the system. Also, there can be no reliable support without a business model in place to provide that, which requires revenue to maintain. Some Free Software (Open Source) solutions also come entirely free of cost, and this is a good thing and possibly an option if you have highly skilled team members on site in your organisation to maintain, update and secure your Free Software / Open Source CRM. However, paid solutions do not always mean reliability and most often, no freedom. It is important to check the license of the software whenever entering into a contract with a vendor. One of the main issues with a proprietary CRM system is that the buyer cannot maintain the software as the source code is not legally (and often physically) available to modify. This means that if the sole vendor ends support, the system is no longer available to the buyer. Another risk is that the Vendor is the only one who can make modifications to the software. This may mean that required modifications may not be made for the business to comply with legal or procedural changes and the price of modifications can made as high as they see fit. This type of problem typically exists in Custom CRM Systems. A custom CRM solution brings with it the power and ease of use to fit into a business perfectly. This can mean a much higher ROI (Return on Investment) and much better user-adoption and buy-in. However, custom CRM systems pose the risk of vendor lock-in if they do not come with the freedom to use and modify the system as you wish. An independent programmer who retains copyright over the CRM system source code creates the same trap as a large software vendor with remote cloud-based systems. These are remotely installed systems that may offer some type of user-configurable customisation, although it is usually complex and limited. They can suffer from all of the risks of remotely installed systems, plus vendor-locking and proprietary software. One option is a fully 'Private Cloud' which generally means that you ave root access to your operating system (i.e. it is not being shared with others and you can do as you wish both physically and legally) and you can install any type of CRM you wish. Combining a Private Cloud with a Free Software CRM system can result in the very best option for a CRM system. It is convenient to be able to download an application and use a CRM system but it is very important to ensure that the system is Platform-Independent. This means that it will run on any device, even without an application installed. The main way to do this is by only using CRM systems that adhere to Web Standards. These are open standards that ensure that accessibility is not limited with advantages such as compliance to access for disabled users with screen-readers etc. In a practical sense, if a CRM system were tied to a specific client application then it would be unusable without the legal agreements connected to the specific device that the application runs on. So, even if the server software were no-cost and also Free as in Freedom and even I f the application were no cost, it would still not be a system the provides freedom as the crucial client application software, required for access would be proprietary and platform-specific. If these conditions are met, then the resulting CRM system would be one which is a safe investment. Lets have a look at the CRM marketplace and the vendors who provide CRM systems. What is size of the CRM system market? The Ireland CRM market was valued at USD $23.14 billion in 2014 and $ 36.5 billion by 2017. It is anticipated to grow to over USD $81.9 billion by 2025 [Grand Review Research 2016]. This is a vast marketplace with a myriad of investors in different industry niches and with a variety of localisations along with dominant industry players internationally. The North American CRM market was estimated at around $7.6 billion and Europe at around $3.9 billion in 2012 with substantial continued growth to today and into the future, along with Asia showing rapid growth. The growth for CRM software has been fuelled by the growth of the Internet. The ability to share data quickly and across the world in real time has meant that customer data management can be out sourced as BPO (Business Process Outsourcing) to countries which provide a much lower cost in regard to employee wages. We can take a look at where CRM software came from. As paper-based files transitioned to computer based files, so did customer records. They began on mainframe computer systems as customer databases and allowed physically connected computer terminals to access the data. Enterprise Resource Planning (ERP) systems are business management systems that include modules such as CRM and SRM (Supplier Relationship Management). CRM was so important to marketing that it became an important system all on its own. CRM brought together customer databases, telephone and email marketing, contact management and customer communication into one system. Let's take a look at who the main CRM vendors are. As you can see, all of these major vendors offer only proprietary solutions with no control over the source code. But these are not neccesarily 'Free Software'. Free Software does not mean free as in no cost. WebDesktop abnd Suite CRM are truly Free Software CRM systems. A CRM System can vary in price. The exact pricing model depend son whether it is acquired as a capital acquisition or as a service. A service model payment has the advantage of being immediately tax deductible while a capital acquisition relies on depreciation over ta proposed lifetime of the system (eg. 3-5 years). All of these prices are for renting the software, not running it on your own system. Once payment stops, there is no asset and the service ends. Typically, payment is required 3-12 months in advance. Are Industry Specific CRM Systems Available? Industry specific module changes can make a CRM system especially useful and incorporate best practices for that industry. What Modules can be added to CRM systems? A complete enterprise-wide system (or CRM system) can be created by connecting these modules when they utilise a central data store. What Can Be Customized in a CRM System? The level of available customisation depends on which system you choose. If you find the right system, everything can be customised. However, customisation should always be carried out by a professional CRM consultant, as small changes in one area can affect the rest of the system. Who maintains a CRM system? CRM systems are maintained most often by the vendors either by a local support technician or by a remote agent with regard to cloud based systems. Usually, a maintenance contract is made for server based systems to ensure there is a response in the event of a critical problem such as a security compromise. Support is the most important area of CRM use as without it, organisations are unable to make changes to their systems. It is critical that support can be carried out by third parties if required to ensure a competitive landscape in CRM maintenance as not to put the business in a vendor-locked situation. An experienced CRM project manager can overcome all of these pitfalls if given the remit to do so. How to Select the Right CRM System and CRM Provider? If you chose a reputable CRM consultant and vendor, they will assist you with your requirements gathering. As experts in CRM implementation, we 100% are confident that you will find our CRM consulting, design, installation and maintenance service of the highest standard. We can provide you assistance globally with our advanced remote technologies without sacrificing the freedom of your CRM system (you can own the server, OS, platform and system code).